Beautifully renovated and it looks lovely! Bedroom with French doors into the garden, air conditioning, wood panelled ceiling with fan modern bathroom,sitting room has a panelled ceiling with fan open plan kitchen (oven/microwave/fridge/freezer) seating for 4. Folding doors open onto the covered terrace which makes it bright and airy here we have a dining table/chairs & easy chairs for the cocktail hour.We have a large front lawn so plenty of room to sunbathe however be very cautious of sitting too near the coconut Palm!. The private members pool and beach is a short walk away (there is a $50 BDS refundable deposit on the entry card) attached is the The Beach House restaurant.Three steps down to the gorgeous beach and the beautiful Caribbean sea.The famous Sandy Lane beach is in walking distance. 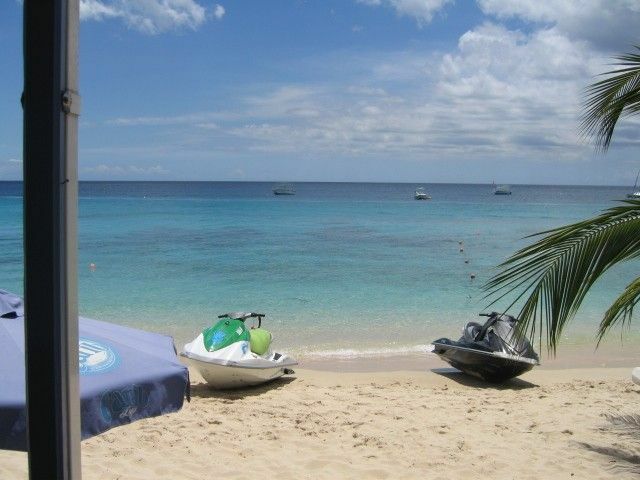 Holetown beach has trips on glass bottom boats,jet skis,water skis. There a very well stocked supermarket for all your needs.The bus stop to Bridgetown is two minutes away and a must see when coming to Barbados and North to Speightstown. Hi My favourite place to be is Barbados but returning to London is always fun. I also have an apartment in Cagnes sur mer in the south of France. I bought the property because it was the nearest property to the pool and the Beach and Zaccios the beach restaurant that I could find! We have TWO shower rooms which is wondeful advantage when returning from the beach and both needing a shower to go out for dinner. Ellie was extremely helpful leading up to our stay at the property and was very prompt to reply to all queries. On arrival we met Jacintha the representative for Ellie and she was very friendly checking us in. The property was clean and tidy and is in a good location. There is only air con in the bedroom, which meant the only place we could sit and cool down was on the beds, this said, there is only a bed sheet provided as cover and no blanket.. it was tricky trying to find an air con temp over night that meant we were warm enough under just one sheet. The property had a large amount of ants in the bedroom and around the kitchen area, these got into our food and cupboards. We spoke to Jacintha and she said th we were running ants and were harmless. We bought ant spray and got rid of them. Lovely place, Ellie (owner) & Jacintha (housekeeper) were both lovely and really helpful. The cottage is ideal and fully equipped. We were unfortunately called home after only 3 days because of family illness and Jacintha was really kind when we handed the keys over. We would love to return in better circumstances! The apartment was very nice, situated very close to the beach house and amenities. We also found it very easy to get out and about to different places of interest. We loved this place - clean, modern and had everything we needed. Very close to the beach, restaurants and supermarket. We also really enjoyed having access to the private members pool. Very nice accommodations, location, location, location..... close to beach, supermarket, Scotia bank for currency exchange,restaurants, members club access. Clean upgraded unit with all that you'll need for a fantastic holiday..... thanks so much Ellie. Was a little gem hidden away in holetown everything was perfect.. I am so happy you loved it as much as I do.